Protein Perfection - Protein Water. Revolutionary drink. 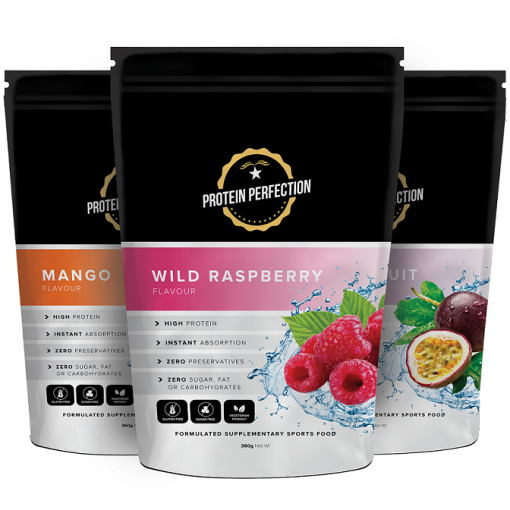 Protein Perfection – Protein Water is a revolutionary new product! Forget proteins that don’t mix! Forget the unpleasant milky texture! GLUTEN FREE! We understand getting enough protein each day is hard and drinking plain water can be a pain! We couldn’t stomach dairy proteins either so we invented this protein water! It mixes instantly with water while giving a smooth texture and delivers the best taste! Don’t compromise your protein intake with thin milky taste or that sick bloaty feeling ever again! Protein Perfection is manufactured in a world class facility in Australia. It is made with high quality ingredients, using plant derived free form amino acids which gives the product a superior protein profile. To ensure we have a great tasting product, we developed this protein water with members who have had bariatric surgery which includes gastric sleeve, bypass and lap band surgery. Protein Perfection Protein water is low in sweetness with a hint of fruity flavours, tasting like a light cordial. We use instantised amino acids to make this product, which results in your body absorbing 99% of the protein and having no impact to your digestive system. Because this protein water absorbs immediately into your system, it is superior to most common proteins such as whey protein which generally takes time to digest. For each scoop (1) take between 200 – 1000ML of water, or taste preference. 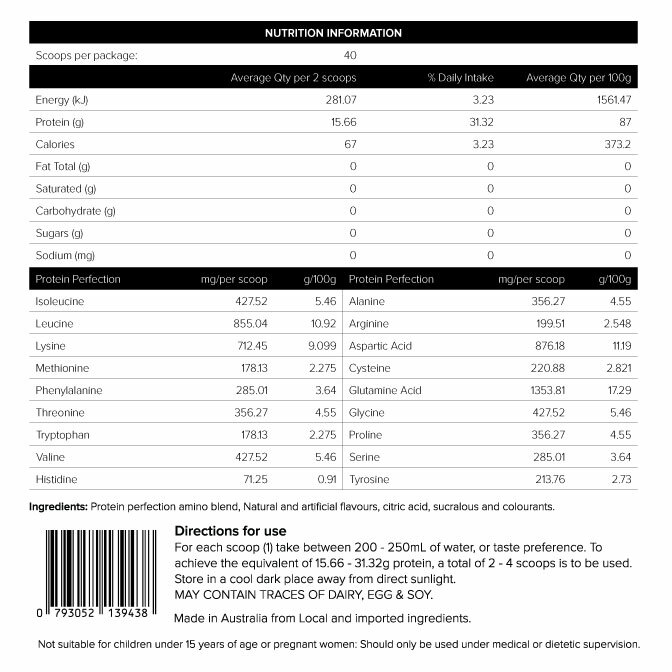 To achieve the equivalent of 15.66 – 31.32g protein, a total of 2 – 4 scoops is to be used. Store in a cool dark place away from direct sunlight. MAY CONTAIN TRACES OF DAIRY, EGG & SOY. Not suitable for children under 15 years of age or pregnant women. Please seek medical or dietetic supervision for use and consumption of supplements. For more information read about our protein water or our FAQ’s.